We've added 2 new services to Locify. We suppose that these with the previously published eventful service will cover local events completly. If not, please feel free to add your own favorite service - with Locify it's easy. Add these services from the service directory or directly from Locify mobile client. Today we have released a new version of Locify. The most visible new feature is a support of routes. So don't hesitate and download latest version! We are going on Smartphone Show to London, 21 - 22 October 2008. 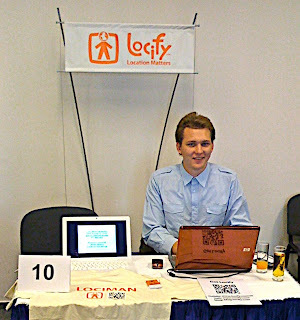 Let's meet there - write me at dac [at] locify [dot] com. See you there! It is very popular to organize developer's challenge with huge prize money. So we cannot stay aside and here it is! Best Locified. And because we believe that money is not the most important (and we have some other minor reasons), we offer as a grand prize our unique sweathershirt! Why unique? Because now only 3 pieces exist! Do you have an idea about location based service? Or you have website which can be locified? Read more and go on. We have exhibited at EASY Central Europe Investment Marketplace (October 3rd Prague). Who does not need investors? We will be happy to have one(s). Coaching, management know-how, contacts and ... well ... money. 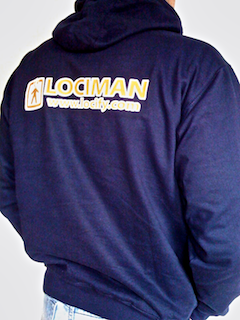 Beside investing in great company as Locify is, investor will get the wonderful t-shirt you see on the picture ;). So hurry up! We helped to organize geocaching like game at the Invex/Digitex - the international fair of ICT in Brno, Czech Republic. We have prepared a custom Locify version for this occasion - so users with Locify mobile client gained a lot of advantages - easy navigation, online results posting and detailed map of the fair. This proves that Locify can be used for creating wonderful real-time GPS games. Read more about the game here (in Czech language). This week we have moved all our infrastructure to Amazon Web Services. Why? Better reliability and scaling. Amazon is pushing hard, adding a lot of interesting features. In fact I will hardly find any argument why not to use AWS and use own hardware (for company like Locify).